RecSchool, Grove City Parks and Recreation’s preschool program, offers a nature-based, age-appropriate learning experience for pre-kindergarten children ages 3 through 5, at Gantz Barn in Gantz Park, 2259 Home Road. Registration for the 2019-2020 school year begins mid-February. Licensed by the State of Ohio, RecSchool prepares young children for success in school and beyond by fostering a love of learning, self-confidence, creativity, social skills and independence. The preschool operates September through May, with half-day classes offered two or three times per week in the morning from 9 to 11:30 a.m. or the afternoon from 12:30 to 3 p.m. Children must be 3 years old by Sept. 30, 2019 to participate. At RecSchool, children learn through independent discovery, planned activities, meaningful play and social interactions. Experienced teachers plan art, literacy, music, math and science activities to create a well-rounded and thought-provoking curriculum. 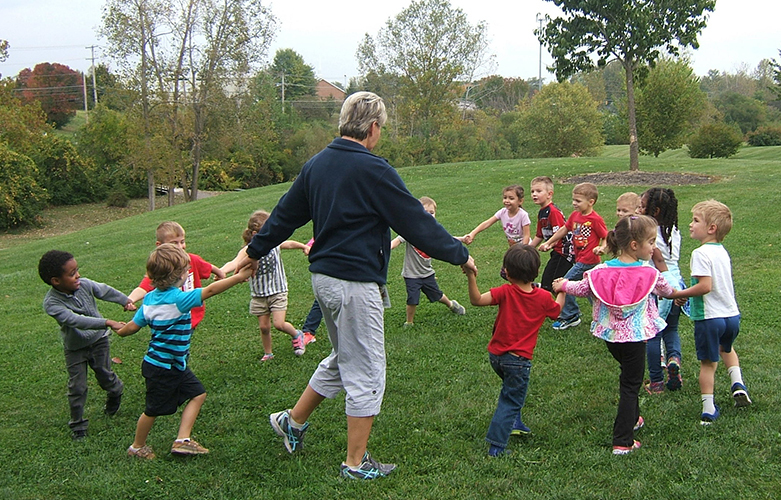 Children spend a portion of each class exploring Gantz Park: they venture through the woods, walk along the creek and gather natural items to study in the classroom. RecSchool teachers recognize that time spent in nature supports a child’s sense of wonder and adventure, increases the child’s ability to focus, improves mental and physical health and allows children to feel happy and free. To receive registration information, contact RecSchool Coordinator Michele Demmy by phone at 614-871-6330 or via email. Visit the RecSchool web page for more information.